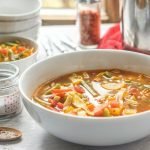 This low calorie and low carb vegetable soup is my super tasty version of that cabbage soup everyone makes. It's full of flavor and healthy vegetables and easy to freeze. Each serving has only 70 calories and 5.1g net carbs. In a large soup pot, add the oil and heat to medium high. Add in the mushrooms and all the spices except the garlic. Mix well and let the mushrooms cook for a few minutes until they are almost cooked. Add in the rest of the vegetables, tomato paste, Better than Boullion and water. Mix well and bring to a boil. Then turn down the heat to let it simmer for 20 minutes. Now you want to add in the Parmesan cheese and crushed garlic. Mix well and let it simmer for 5 minutes more and you are done. You can freeze this soup and just reheat on the stove or in the microwave. **You can use vegetable Better than Bouillon if you want to keep this vegetarian or you can use chicken or beef. All will work well in this recipe. If you don't have better than bouillon, use regular bouillon but I highly recommend the Better than Bouillon products because they add so much flavor.